Cherry tomatoes are wonderful picking and eating right out of the garden. Favorite tomato for cooler growing climates. Short plant produces early crop of large, 'salad-type' cherry tomatoes. Our most popular tomato due to "Its splendid taste." Huge clusters of 1", round, deep-purple, cherry tomatoes. One of the “best tasting” cherry tomatoes. Deliciously sweet with a citrusy tart finish. Good for cool climates. 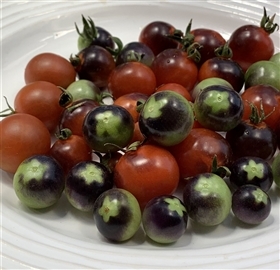 Produces big quantities of 1/2", dark-purple cherry tomatoes with acidic/sweet flavors. Beautiful and unique novelty. Good tomato variety for cooler growing regions. Produces well until frost. Great for growing in pots on patio. Yields large crops of mahogany brown, 1”, cherry tomatoes with semi-sweet, rich flavors. Great for snacking or salad. 1" cherry tomato with sweet tomato flavors. Our most popular and favorite cherry tomato. Disease resistant. A winner! Bursts with a fruity sweetness similar to the popular Sungold, but lower in acid. Great salad or snacking. RARE. Very popular with home gardeners and farmers markets. Thought to be the best cherry tomato available. Ancient heirloom. Pea-sized, currant-cherry tomatoes that are very sweet. Kids will love these. A long-keeping tomato. HUGE amounts of 1/2-3/4” yellow cherry tomatoes with unique, sweet but tangy flavors. Considered “Tomato candies." Produces jewel-like, ivory-colored, 1/2-inch, delicious cherry tomatoes. Suited to hot and cool climates. RARE. Crazy, if you don’t try these prolific, plum-sized, ¾”, cherry tomatoes. Very sweet. Great for snacking. Rose-pink, cherry tomatoes with sweet/tart taste for cooler growing regions. Good snacking or salad tomato. Unique, 1" tomatoes with gold and red striping and indigo-blue shoulders. Delicious tangy flavors. RARE. Fantastic round, 1”, ivory-colored, cherry tomatoes, borne in clusters. Delicious sweet flavors. Lots of character! Sprawling plant produces plentiful crops of 1" red, delicious cherry tomatoes. Does well in cooler and hot climates. A WINNER all the way around for beauty and taste. Super fruity-sweet. Crack resistant, even in heavy rains. 1 1/2-inch, creamy-yellow, cherry tomato with a citrusy flavor to its sweetness. An American favorite. Fantastic snacking tomato in the garden and brightening up salads or pizza. Great choice for a market tomato. Indeed this tomato is a delight, and delicious. 1”, cherry tomatoes borne in clusters of 6-12. Loaded with sweetness. Unique and delightful. 3 oz., white, cherry tomatoes with yellow shoulders. Sweet, fruity flavors to add to a salad.